The first ever FuMP convention is here. Commemorate this historic occasion with the official FuMPFest t-shirt. 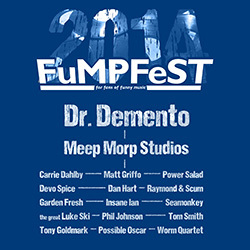 The shirt features the FuMPFest 2014 logo along with the names of all the guests who appeared at the event. Available in sizes Small, Large, and XL.